Our access control systems, locks and equipment are trusted by companies in Niagara Falls, in industries including finance and health care. We install Access Control Systems, Intercom, Door Entry System, Locks and Equipment into many Niagara Falls businesses including finance and healthcare providers. Best Brothers Group are experts at installing the latest commercial security systems into many businesses located in the heart of Niagara Falls. We offer a wide range of commercial access control systems to many sectors in Niagara Falls, this includes technology, industrial, financial, communications and healthcare businesses. A seamless integration of a variety of our product offering enables us to offer total solutions for integrating access control systems, CCTV, digital video, cards, readers, door hardware, printers as well as time and attendance products. As part of our service, we will work with you to design the best and most secure access control system for your Niagara Falls business premises, whether you need to control the access to a single door or your entire building. We offer other integrated security solutions which work hand in hand with our access control systems in Niagara Falls. 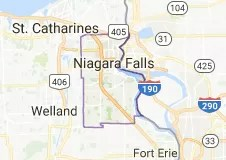 BBG Security have over 10 years of shared experience installing access control systems and integrating with other security systems to make unique solutions for businesses in Niagara. We are Niagara’s trusted commercial supplier, installer and maintainer of a wide range of alarm and security systems. Security is more important to businesses of all sizes in Niagara. Upgrade to access control systems with Standalone Keypads, Card Readers and secure your business today!